In our little corner of the world winter just up and disappeared for a week or so. Mountains of snow melted into the gardens, replenishing the ground water that dried up during last summer’s drought. We have set record high temperatures and the Snowdrops are pushing their little noses out in a couple of spots. They will all withdraw this morning; winter’s back. When the snow receded I found the buried Brussel Sprouts. They went from plant to pot within a couple of hours and they were wonderfully sweet and tasty. Served them to some cousins and she agreed that they were delightful. He shamefully admitted that he didn’t actually like Brussel Sprouts and his portion was divided into three before he even had a chance to reconsider. The days are short and dark. The furnace is blowing hot, dry, dust laden air about the house and just reading seed catalogues is not satisfying your inner gardener anymore. Leap from your chair and get a bucket of warm slightly soapy water and refresh your house plants. Even the most “Martha-ish” amongst us don’t dust the plants regularly. With that bucket of water and couple of soft cloths or sponges you can do some worthwhile winter gardening. The smaller, leafier ones can rush off and have a shower. 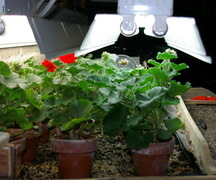 The bulbs that are potted up in the cold room need to be checked. They must be kept moist if they are going to continue to grow roots. Without these little details, they will not give nearly as many blooms when we bring them upstairs next month. Those miniature Daffodils really are a balm for the gardener’s soul as winter seems to drag on. I seem to have developed a technique for growing Geraniums indoors. The few cuttings I took in early September, are now overflowing my light table with thick multi-branched plants and the cuttings that survived last months lazy technique are also flourishing. The secret is in the lights. 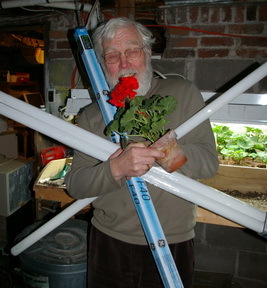 Whatever fluorescent bulbs you use, you must keep them close to the top of the plants. Light decreases over distance traveled. I keep adjusting the lights upwards to allow for the amazing growth but they are never more than 5cm (2") above the top of the plants. When I went to purchase some new fluorescent tubes there was an amazing array of choices. Follow the link to help you make your choices. The basement is quite cool, about 17 - 18C during the day and cooler at night. Of course the night and day are driven by the timer on the lights. I provide about 16 hours of light per day and apparently it is working well. The Geraniums are also fertilized occasionally, probably about every 2 - 3 weeks when I realize it has been a while since I last did it. I know I should keep a chart with times and quantity of fertilizer but somehow that’s just not my style. Certainly don’t want them over fertilized. I use a dissolvable 20 20 20 at about half the recommended strength. It’s time to lose myself in the catalogues again so that I can report in the next issue of Dallying about the new varieties that I think might merit a spot in real garden. Nadia asks? Nadia’s question arrived moments after I sent out the last issue when I noted that nobody had asked any questions. She was wondering about my success or lack of it with Geranium cuttings? Ken answers! Follow the link at the top of the newsletter and you should find all you need to know about the timing and method of propagating Geraniums by cuttings. Maryellen asks? Received an Osage Orange to use in a flower arrangement and loved the berries. It apparently takes 10 years to flower from seed. Help? Ken answers ! Osage orange, Maclura pomifera is a member of the Mulberry family that is native to Texas and Arkansas but grows as far north as Southern Ontario. Not only does it take a long time to flower but it is dioecious, (has separate male and female plants,) so that after 10 years you may have nurtured a male plant and get no berries. It apparently can be grown readily from cuttings or by layering. A brief search did not reveal any Canadian nurseries listing it and I have no personal knowledge of where one is growing that you might get a cutting from. Will keep looking. Claire asks? With regards to houseplants, why do I always seem to get a white film on my soil? Am I over watering? Also, can you tell me what flowers are in season in August/September? Ken answers ! If the white film is slightly textured then it is usually a build up of various salts that are in your water. Do you have a water softener. 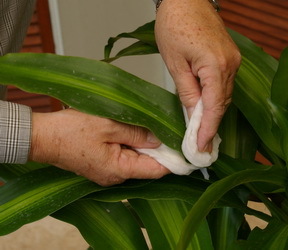 Never use water from a water softener to water your houseplants. The way to get rid of that film is, unbelievably, to water more. Put your plants in the sink and run lots of water through them so that the film is dissolved and leaches out the drainage holes in the bottom of the pot. No drainage in the pot? Maybe that’s the problem. Why do you care about the flowers in late August? Are you planning a special occasion?? Do you want flowers in containers or in bouquets or both?? There are too many possibilities to answer here. Private consultations can be arranged.